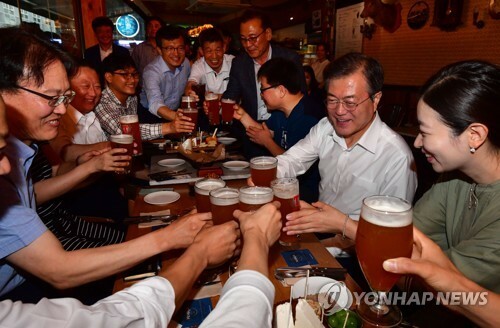 SEOUL, July 26 (Yonhap) — President Moon Jae-in held a rare meeting with citizens Thursday, largely to listen to their concerns over economic conditions sparked by a planned minimum wage hike. “I promised to communicate with the people, to meet with citizens after work during my election campaign,” the president said of reason for the meeting. “Recently, the minimum wage and employment have become serious issues, so I came without preparing any message today and only to listen to what our workers had to say,” he added, according to Cheong Wa Dae pool reports. Thursday’s meeting came after the Minimum Wage Commission decided to raise the minimum wage to 8,350 won (US$7.45) per hour from the start of next year, up 10.9 percent from the current 7,530 won. The minimum wage hike is closely linked to Moon’s key economic policy of income-led growth, which seeks to create a virtuous cycle of increased income and increased spending that he says will lead to overall economic growth. “The minimum wage issue may be taken differently in different areas just as prices differ in Seoul and in other areas. On the other hand, the minimum wage is designed to help those who are unable to make enough to make a living, and so allowing different wages depending on the area and occupation may go against the very purpose of setting a minimum wage,” Moon said. The second meeting lasted about 40 minutes before the president returned to his office Cheong Wa Dae, according to the pool reports.